In many industries, products are profitable only during a limited window of time. We see time-sensitive products, of course, in consumer electronics, where new models of phones, computers, and home entertainment products come (and go) frequently. We also see this pattern in fashion markets. Zara, for instance, introduces new clothing products twice weekly across nearly 2,000 stores – amounting to the introduction (and retirement) of over 10,000 designs a year. 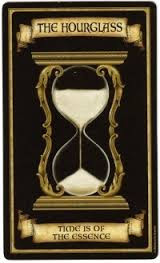 Timing is key, as well, in the introduction and short shelf life of cultural products, such as popular music and films. The market for video games follows a similar pattern of rapid new-product introduction and short product lives, including flash-in-the-pan hits like Pokemon Go as well as the more cadenced, but still time-sensitive, annual replacements of the various EA Sports games. Innovative pharmaceutical products also compete in a time-sensitive way, since the first to patent enjoys a profit premium that ends abruptly with patent expiration. Consequently, drug companies are in a race against time, first to file the patent, and then to bring the drug to market. Even some durable products, such as automobiles, are introduced and retired on a time-sensitive, if cadenced, basis. Time-sensitive markets can be identified by the presence of two underlying features. First, these market place a premium on introducing a product early – or at least on a reliable schedule where being late is punished. For instance, releasing a new version of a gaming console like Xbox or Playstation late - after the holiday season – would be unthinkably costly for Microsoft or Sony. Second, the products in these markets also have a limited shelf life. A new clothing style or a new hit song may be wildly popular today, but within weeks (or maybe days) they will be yesterday’s news. In such time-sensitive markets, success depends on a distinct logic: the time-to-market strategy. 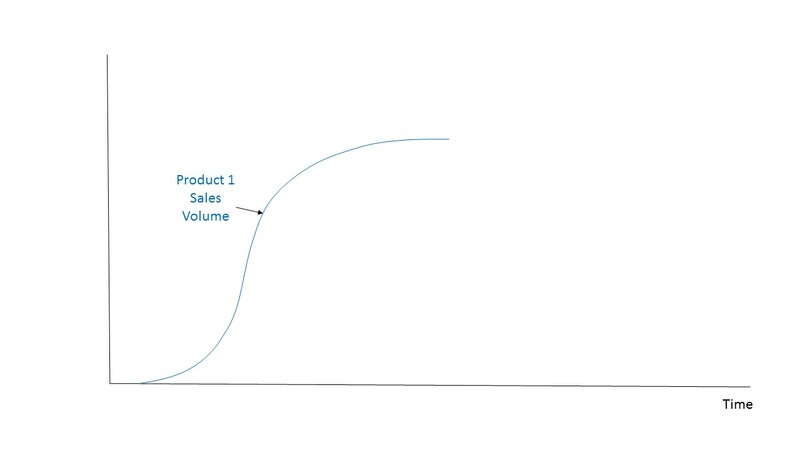 To understand this strategy, consider a firm that introduces a successful new product, “Product 1,” as in the plot below. 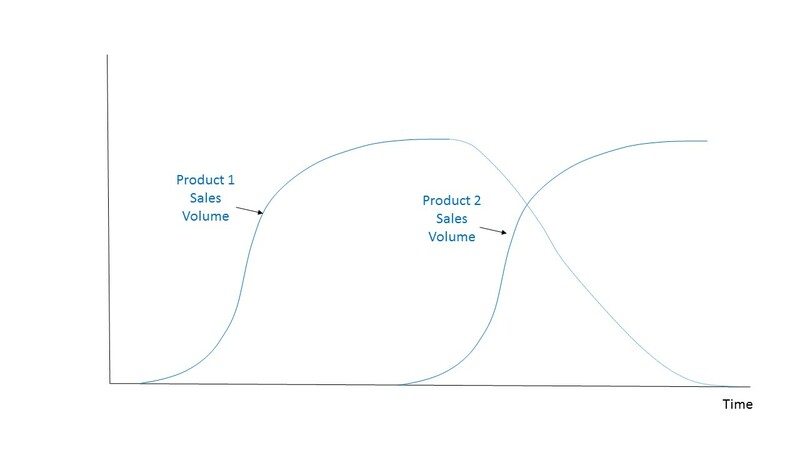 Initially the product takes off slowly, and then it catches on, finally reaching a maximum market size. 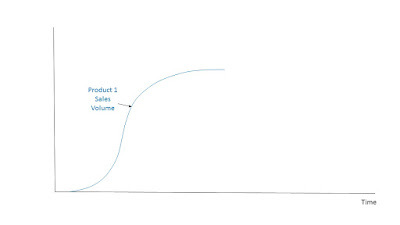 This “S-shaped” diffusion curve is typical of successful products. The story does not end there, however, because this company is facing a market where the shelf life of a product is limited in time. Consequently, it is preparing to introduce a second product, “Product 2,” that will compete directly with its own Product 1. Note that if the firm does not introduce Product 2, somebody else will. That is what is compelling the company to continue with the introduction of another product even though it will cannibalize its first product, as shown here. Now focusing in on Product 1, we can see that there is a limited window of time during which the firm can make money selling the product. It is interesting to think about the price that can be charged for Product 1 over the life of the product. Typically, the price that can be charged will be much higher earlier in the product’s life, for two reasons. First, the earliest buyers of the newly introduced product will be those with a greater willingness to pay for the product. For instance, if Intel comes to market with a new chip that is extremely valuable to cloud service providers running state-of-the-art server farms, these eager buyers will be the among the first to buy this new chip and they have a high willingness to pay. Less enthusiastic buyers will also buy at some point, but only if the price falls. Second, the price will begin to fall over time as other competitors come out with a product that is a direct rival to Product 1. For instance, perhaps AMD will introduce a competitor to Intel’s new chip. As the price falls, now more and more chips are sold as other buyers come into the market with lower levels of willingness to pay. 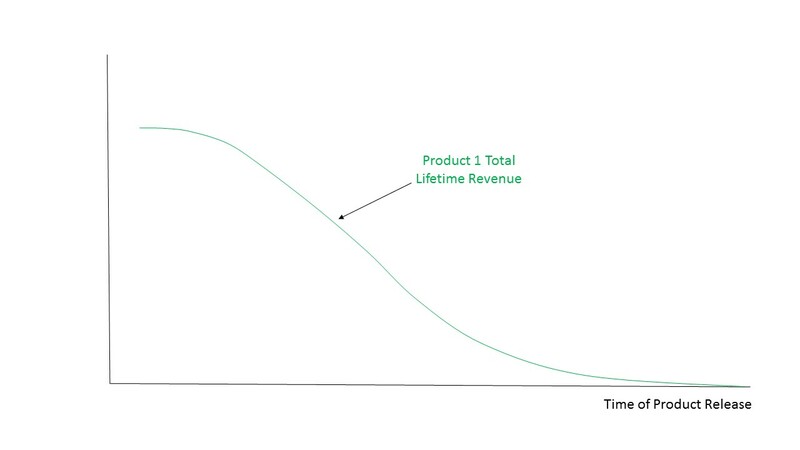 Ultimately, once Product 2 is on the market, the price for Product 1 falls away completely. This pricing dynamic is pictured below. At this point, the logic of a time-to-market strategy is clear. If we introduce Product 1 as shown, our firm will make a great deal of revenue. To see this, look at both the price and sales volume curves in the plot above. 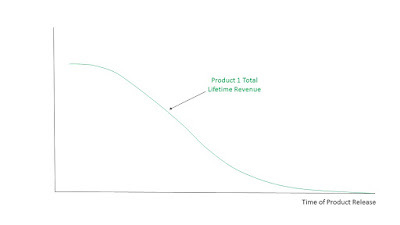 Revenue from Product 1 is found by multiplying these two curves, and total revenue over the life of the product is just the cumulative revenue over time. However, what if we are another firm and we release a competitor to Product 1 – but we do so late. 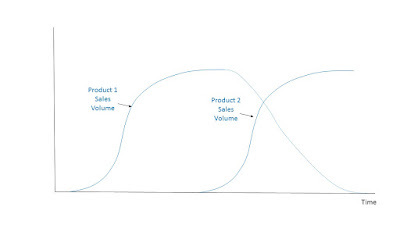 A competitor entering near the end of Product 1’s life may sell at high volumes, but only for a short time and only during the period when the price of the product is very low. This firm will have introduced a product that, over its life, will make very little cumulative revenue. So the earlier a firm enters into this competition, the more it makes in cumulative revenue. In fact, entering earlier increases total cumulative revenue at an increasing rate. By this logic, it is obvious that we should release Product 1 at the soonest possible date. However, this may not be profitable. To see this, consider now the costs of developing Product 1. If we could take all the time we want, we could carefully research and develop Product 1 and, when it is ready, we will have run up total costs equal to C1. But by taking our time, we might end up introducing the product late, and this will hurt our revenue. So instead of paying C1 over a long period of development, say, 2 years, what if we accelerate development and pay the same amount but all in one year – or even in six months? Well, here is the bad news. 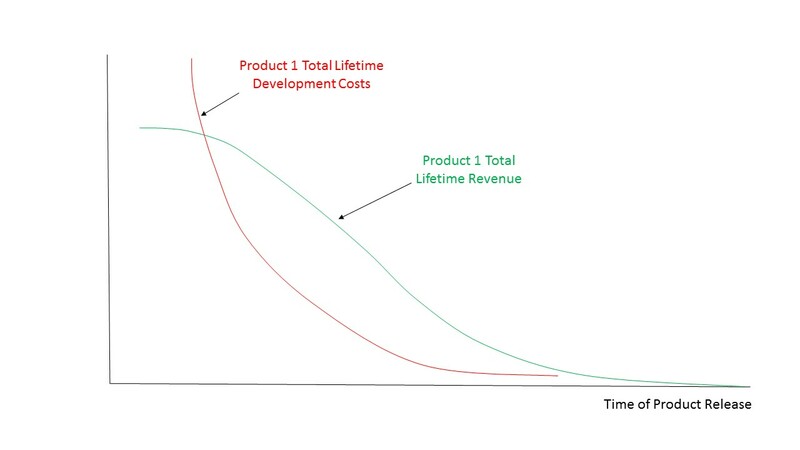 It turns out that compressing development costs into a short period does not give you the same result. This problem, famously dubbed the “mythical man month” by Frederick Brooks, occurs for two reasons. First, compressing the amount spent on development causes many to work simultaneously and in parallel, which results in coordination diseconomies. Second, there is the problem sometimes called “gestation,” where development is inherently sequential and cannot be made to happen all at once. Concretely, gestation requires time in development because answers obtained at one point in time decide the questions asked at the next point in time. Doing all this development at once leaves us asking many questions that we will never need to know the answer to – and failing to answer questions that we wish we had researched. Consequently, to speed development, it is not enough to concentrate C1 into a more compressed period of time. Instead, we will have to pay more than C1, and the more we compress the development process, this additional amount will continue to escalate until, at some point, we could spend an infinite amount and not improve our release date any more. So development costs increase at an increasing rate as time-to-market shortens, as shown below. As the figure shows, the time-to-market strategy confronts the firm with a dynamic cost-benefit comparison. 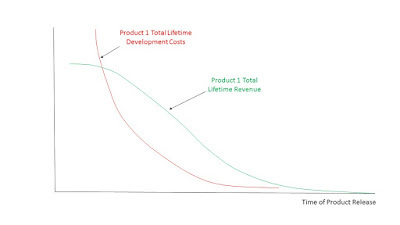 To be profitable, the firm needs to introduce the product early enough to benefit from higher revenue over a longer time, but not so early that its development costs skyrocket. How is a firm to achieve this balance? The answer comes down to organization. Firms that are good at the time to market strategy are organized in a way that minimizes development costs while maximizing the reliability of product introduction. The key factor to be managed by these firms is uncertainty. These firms typically design around customer-defined time milestones, track progress toward meeting those release dates, and hold employees accountable for staying on time. As uncertainties arise, routines such as phase-review processes are used to update release dates or revisit go/no-go decisions. And wherever, possible, the firm contracts with other firms in order to solve “weak link” problems that are slowing its ability to deliver on time. Time-based competition is discussed in my book on the Red Queen.